If you are a Small to Medium Enterprise we can help you compete. Small-to-medium enterprises (SMEs) comprise 96 per cent of all private businesses in Australia, and the sector is the economy’s largest employer and largest contributor to GDP. 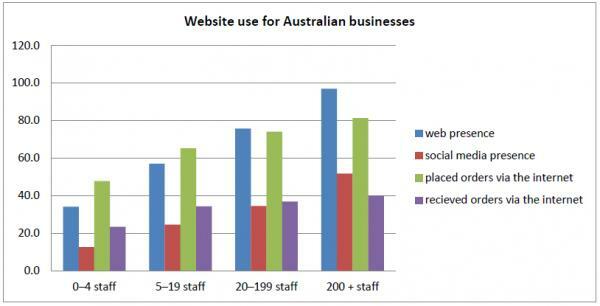 However, many smaller businesses with under 20 staff have been slower to adopt the benefits of having a website, with just under half still lacking a web presence. With more and more customers each year researching their purchases or buying products online, if your small businesses either lacks an online presence or has an out of date website, you may be loosing customers to your more visible competitors. At Hook and Loop, we understand the difficulty small businesses face in devoting enough time to all aspects of marketing, including preparing and launching a website. With our integrated copy and design offer, we take the burden off small businesses, allowing you to concentrate on building business and serving customers. We have developed a range of website options for SMEs ranging from a start up website and a professional option through to a full ecommerce site package. Our mobile friendly websites come with a robust content management system so that you can update them yourself, and are scaleable as your business grows. We’re not just a web design agency. Hook and Loop can provide you with your complete business branding solution from logo development through to arming you with a variety of marketing tools. You can get set up with a value for money packages or talk to us about custom work. Staying in touch with your prospects and existing customers is one of the best things you can do to grow you business in a cost effective way. Hook and Loop can support regular marketing to your database by producing brand publications including enewsletters, taking care of the content and design for you. If you need support with your SME marketing, please call us now for help!